You need to keep an eye out on this series. As good as three Sapporo domes? If the anime is even close to being as good as the manga, this should be one the best shows of the season. If it isn't, I look forward to Silver Spoon brotherhood. It's a straight on look at look at farming, agriculture, and where bacon comes from (but not cheese - that's supposed to be a secret). Lots of questions are raised that do not have a single correct answer; all of characters are well realized, and no-one is a complete idiot (though with Tokiwa it's easy to forget this). Watch out for the Conqueror of the Century's End. Wasn't sure what to expect from this anime. The setting and events are, from what I can tell, completely different to any other show/manga, and make for a really interesting story. With how much emphasis is put on the agricultural aspects, it's easy to forget that this is a highschool slice of life anime. I have a feeling this will make education fun again. An awesome welcome to the new anime season! Well, I'll keep this brief as I'll lose the will to type as soon as the ending for episode 2 ends...I'm going to be giving this anime a five out of five. You may ask why; Good question, I'll tell you why. My first thought when I saw this anime, I thought, "Full Metal Alchemist?" My second thought was "Cow?" 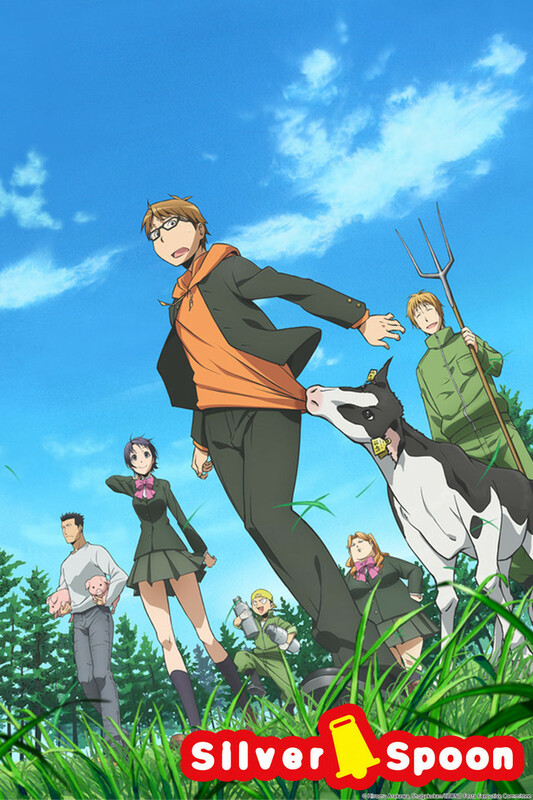 Ladies and Gents, Silver Spoon is an extraordinary anime that does not follow the usual background of modern anime. The plot is set in Northern part of Japan and a large agricultural high school. Without spoiling too much of the plot, our main character. yes the one that has a cow eating his shirt, was a city boy. Due to mysterious reason, he is now in an agricultural high school and living the life of country side. Now this anime definitely is worth watching for my opinion not only because of its uniqueness, but also the development that extend from that very uniqueness. The art is, well....., very FMA like, but I assure you that you will stop comparing character faces after the first episodes. The music is decent, but unfortunately I find it simply decent. The plot is definitely one of the reason to watch because for me, the anime is quite educational. I learned a couple of things while watching the first few episode. The most important factor for people like me to recommend this anime is its humor, the humor that is based on something that other anime doesn't focus on, the agricultural and the farm. I ranked this anime a 4/5 is also because of its uniqueness. I understand that some people won't like this kind of theme, and also the music. I do however believe that it is a quality anime that deserve some merit. I apologize if this impression is very detailed, but I don't want to spoil anything for anyone. However, I do sincerely want people to take a look at this unique anime. This anime silver spoon is so original. The character creation is great. There were so many chances that the director could have took this anime into a cliche direction, but Tomohiko ITO did not. I appreciate that. Its a breath of fresh air when it comes to cute funny anime. This show brings a comedic, realistic approach towards the agricultural side of society as well as agricultural school. Some parts are funny, some are a little disturbing, and it varies from episode to episode. This show had an enjoyable cast with interesting personalities and goals that differ from the norms of our high school. I knew this was going to be a fun anime to watch after the first episode and I highly recommend watching this if you have free time. P.S I would give this a 4.5 but why NOT A 5. A very lively anime and very different indeed. this particular anime is different in its own way not like other anime's its very truthful in a agricultural standpoint. Very lively characters fun to watch kinda get's you to want to be farmer, all in all great. Very unique and fun. Highly recommend it.